Carroll, Joyce et al. 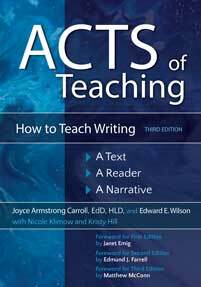 Acts of Teaching: How to Teach Writing: A Text, A Reader, A Narrative, 3rd Edition. 3, Libraries Unlimited, 2018. ABC-CLIO, publisher.abc-clio.com/9781440857812.